Happy Memorial Day, everyone!! Wow, did May go by quickly or what? It’s really hard to believe that it’s almost June already and that summer is almost upon us. Along with summer comes the long course meter (LCM) and Oregon open water seasons…yay! June is a relatively quiet month this year in terms of events, so use it as a good training month and then hit some or all of the many events happening in July (detailed below). The first SOMA party on May 5th was great with most of the swimmers in the Medford area in attendance. We had a great time socializing outside of the pool and eating some amazingly delicious food. I want to give a HUGE thanks to Yeonjoo again for hosting. It was an absolute blast! I hope that most of you took a little time to relax and recover from the months of hard work that went into preparing for the OMS Association Championship meet in April. 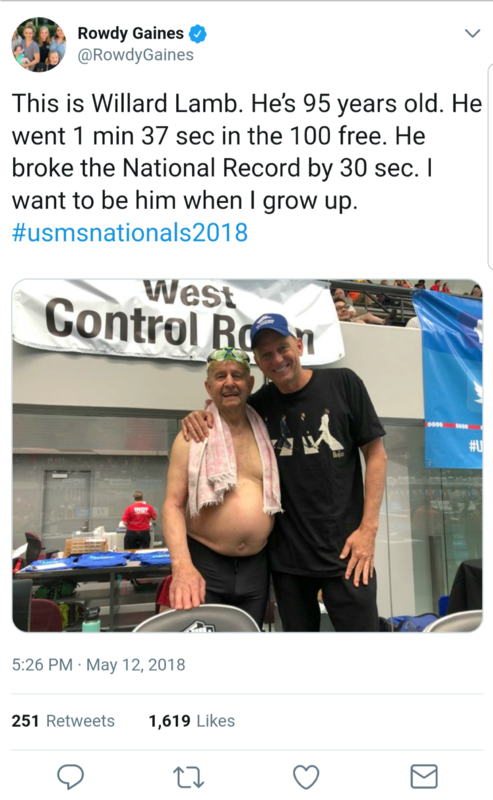 That is unless, of course, you went to USMS Spring Nationals! 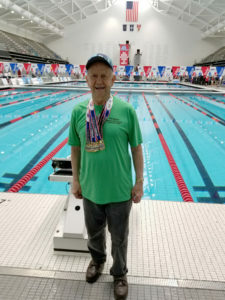 There were 3 SOMA swimmers who went to Spring Nationals in Indianapolis: James Adams, Willard Lamb and me (Matt Miller). 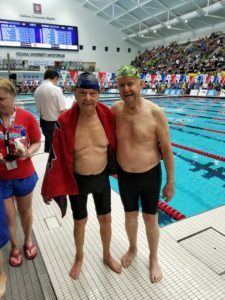 Alice and Barry Fasbender, also SOMA swimmers, were planning to attend but had to sit this one out due to health issues. SOMA had a pretty good showing considering there were only 18 total swimmers from Oregon and 3 of us were from SOMA. We all swam quite well, as did everyone from Oregon. This was the largest USMS nationals meet in USMS history with nearly 2400 swimmers in attendance, so it was very hard to place in the top 10 at the meet. 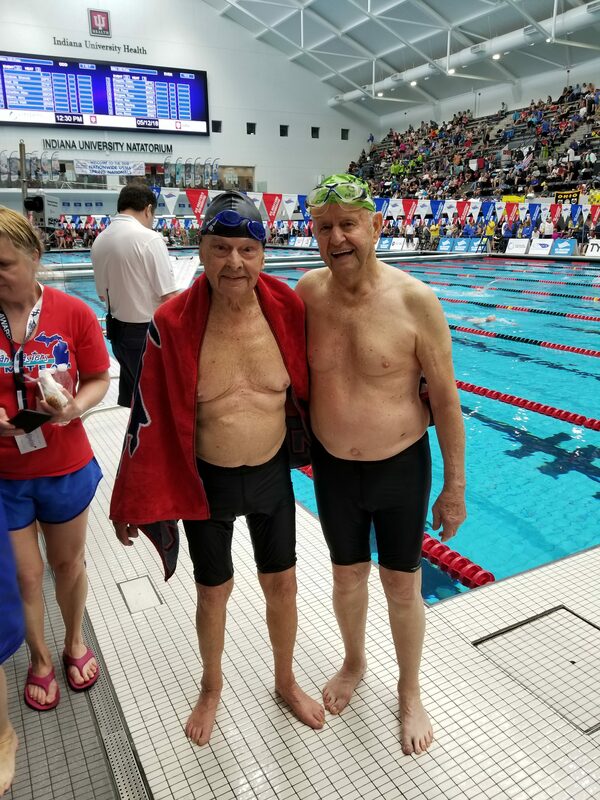 James and I had our strongest showing in the 1650 free where we took 3rd and 2nd, respectively, in the same age group (men 40-44). 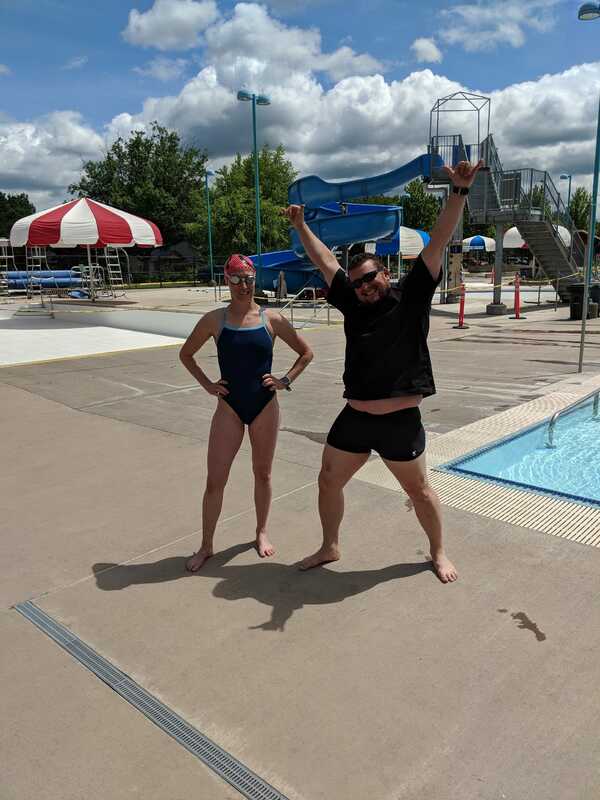 This past Saturday, 16 swimmers from around the Pacific Northwest commuted to the Amazon Pool in Eugene, Oregon, to do their 5K or 10K ePostal swims. People came from as far north as Seattle, WA and as far south as Ashland, OR to swim. The last few years we have rented the entire facility for 4 hours the last weekend in May and this year was the best turnout to date. There were 4 SOMA swimmers who swam: Leah Harris, Willard Lamb, Mike Oxendine, and me. 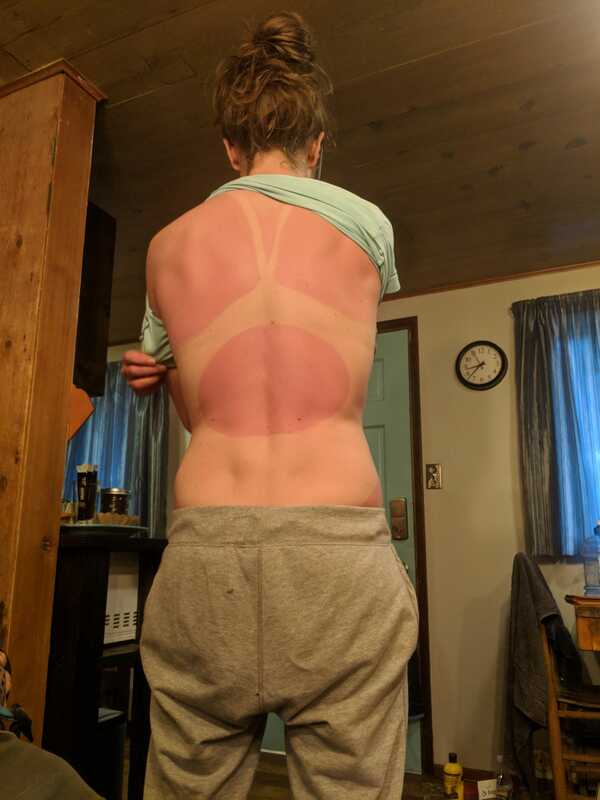 Leah Harris’ back after her 10K…ouch! For Leah and Mike, this was their first every 10K and they both did great! Mike finished his swim in 2 hours and 55 mins, Leah in 3:11:56. I was able to convince Willard to try a 5K, the farthest he’s ever swum. And, of course, he continued his dominant swimming by setting another national record with a 2:08 in the 5K. 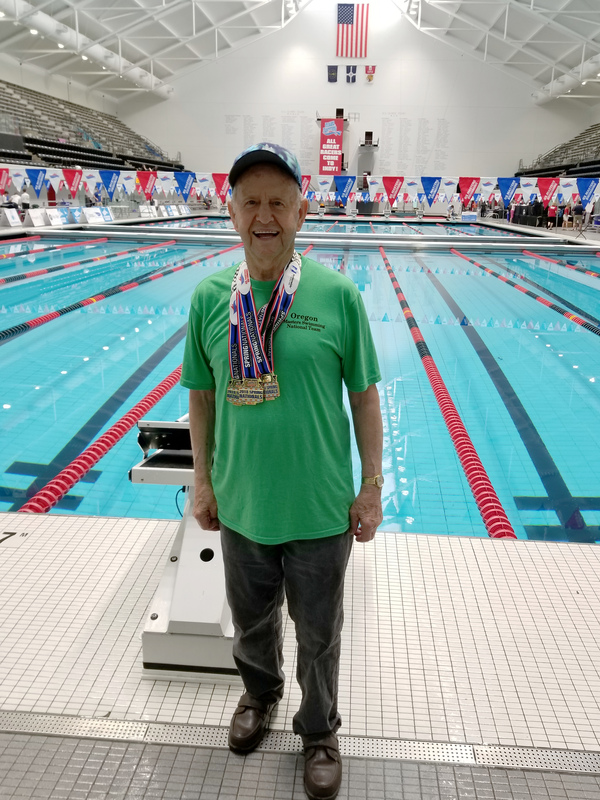 I can’t even fathom swimming 5 kilometers at the age of 95!!! It was extremely motivating for me to have Willard in the pool almost the entire time I was doing my 10K. Every time I started feeling a little down, I would look at Willard in the adjacent lane and get a mental boost to keep churning. He pushed me to a new personal best in the 10K and also a new Oregon record with a time of 2:17:34. 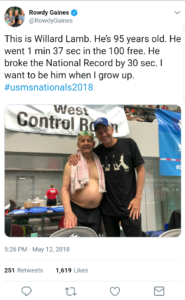 In addition to the great swims by SOMA peeps, there were some pretty amazing swims from others with 3 national records and 3 Oregon records being set. If you would like to do your 5K and/or 10K ePostal (and you should!) but aren’t sure where or when to do it, please reach out to me (matt@flytrapcare.com or 636-209-8916) and I can try to assist with helping you find pool time. Much of below is a repeat from the last email with a couple of additions and one major change: the date of the Gil Young meet has moved from August 24-26 to July 20-22. 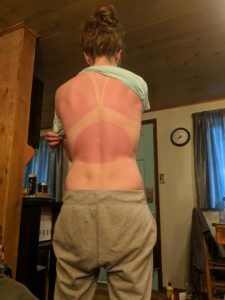 July 12th (Note this is a Thursday) – Foster Lake Cable Swims (1-mile & 2-mile) near Sweet Home, OR: Definitely try to get to this event if at all possible. The 2-mile cable swim is the USMS National Championship this year. The 1-mile cable swim will be the open water equivalent of the OMS Association Champs SCY meet that 30 of us attended in Corvallis on April 20-22. That means that SOMA will be competing against other teams in Oregon and be vying for an open water championship banner. I know of at least five of us (maybe more I’m forgetting) are planning on coming. Let’s all show up for this event and come home with another banner! July 14th & 15th – Applegate Lake Swims at Applegate Lake near Ruch, OR: Our good friends and neighbors, Rogue Valley Masters, will be hosting the longest-running open water swim in Oregon. This is one of the (if not THE) best open water swim in Oregon so be sure not to miss it! On Saturday we offer the 10K (national championship this year! ), 5K and 2.5K. Sunday is the 1500m swim, followed by the crazy-fun 500m pursuit relays. Be there! 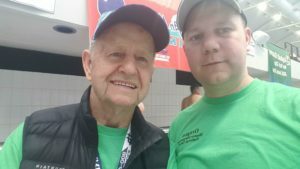 I and Mike Servant will be co-race directors for the event and volunteers are always needed, mostly in kayaks on the water, so if you’re not planning on swimming, plan on coming out to help. 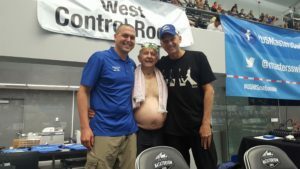 July 20th-22nd – Gil Young Memorial Meet in at Mt. Hood CC in Gresham, OR: This will be the long course meters (LCM) equivalent of the OMS Association Champs SCY meet that 30 of us attended in Corvallis on April 20-22. That means that SOMA will be competing against other teams in Oregon and be vying for a banner. This is a more mellow meet than was the April meet but it is a ton of fun and one of the best LCM meets on the west coast. Nothing beats swimming outdoors. Let’s show up for this event and come home with another banner! July 27th-29th – Cascade Lake Swim Series & Festival at Elk Lake: COMA will host the 24th Annual swim series that includes 5 swims in 3 days. This is the most well attended open water swim on the Oregon circuit, and for good reason…it’s an awesome event! August 11th – Eel Lake Swims in William M. Tugman State Park: Offering 1500-meter and 3000-meter swims, this will be SOMA’s first official hosted USMS sanctioned event. Please plan on attending as either a participant or a volunteer. I’ve done this swim in years past and it is in a beautiful location with wonderfully clean and clear lake. Jayna Tomac will be safety director and I will be race directing the event for the first time (with assistance from Jayna and Ralph Mohr – previous race director). If there is one event to try to get to this summer in order to support SOMA, please make this one! September 8th – Lake of the Woods Swims at Lake of the Woods, OR: Finish the summer season off right, and close to home for most of us (other than our amigos from “SOMA del Norte”) at beautiful Lake of the Woods. 2018 will be the first year that this event will be USMS sanctioned and SOMA will be hosting. In conjunction with the 1500-meter and 3000-meter swims, my good friend Chad Wikander will be putting on a lot of multi-sport events on both Saturday and Sunday so bring the family out and have them all choose an event in which to participate. Given that this event is very close for most of us and at a beautiful location, I expect a good attendance from SOMA swimmers! Also worth mentioning: Jan Hildebrandt has offered to host a party at Lake of the Woods after the event at their cabin. Details to follow as we get closer to the event! November 17th & 18th – PSM SCM Champs: Put this one on your calendar now and plan on attending. Last year we brought a good-sized crew from SOMA to this meet and we plan to do the same again this year. It is the best SCM meet to attend in the PNW and one of the top 5 in the entire country. The King County Aquatic Center is an absolutely amazing facility and the meet is always exceptionally well run. Last year we had 7 SOMA swimmers come, and I hope that at least a dozen SOMA swimmers will come this year. I hope that you consider attending at least some of these events this summer. It would be great to get a large group to come to the Foster Lake Cable swim on July 12th and the Gil Young Meet on July 20-22. It will be so much fun to swim as a group again! 1) The Rogue Rowing coach is looking for men to create a team this summer. Attached is a Rogue Rowing Flyer Spring 2018 if you’d like to join the team. 2) Yeonjoo will be doing some backpacking trips this summer in southern Oregon between one and two nights away. If interested in joining, let her (dlnj9299@gmail.com) or me know. OK, that’s all for now. Enjoy the arrival of summer and keep up the great work in the water. I’ll see most of you at an event sometime soon! Have you done your one-hour swim yet? 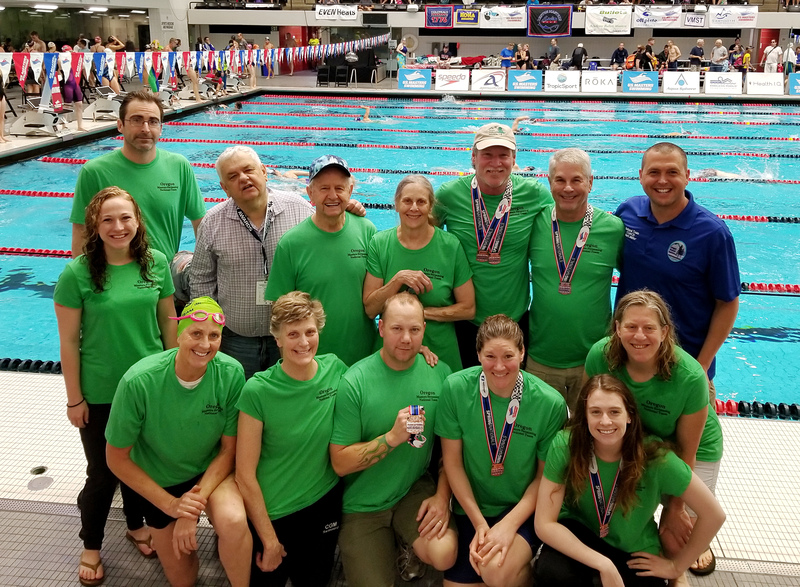 One month away from Oregon Masters Swimming Association Champs! Have you completed your 1-hour ePostal swim? Copyright 2019 - We've found the Fountain of Youth; you just have to swim in it!